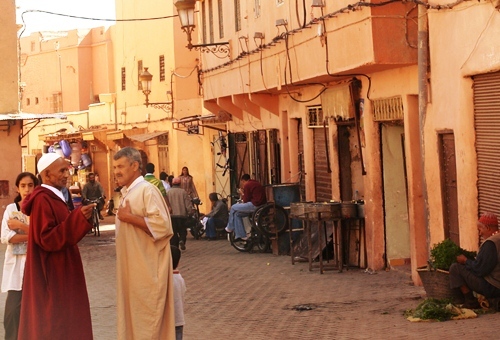 It is easy to get lost in the Marrakech Medina – a cliché, but it’s true, and also half of the fun. The buildings are squeezed together, to use all available space, and limit the penetration of the hot sun to the heads of those walking within. Through these narrow alleyways people throng day and night, between stalls that sell everything imaginable, dodging the vans, taxis, carts and bikes that compete for space with a sound of the horn and relentless momentum. 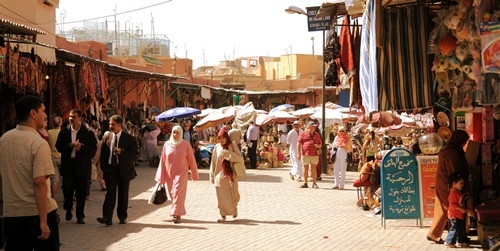 The business of the Medina is trade, transactions completed on the street or in wardrobe-sized shops piled high with products for sale. The cries follow you everywhere… “My friend…” the shopkeepers say, with a smile on their face. “Look in my shop…just a look…no need to buy…” And if you want to, it seems as if there is nothing you can’t take home with you. 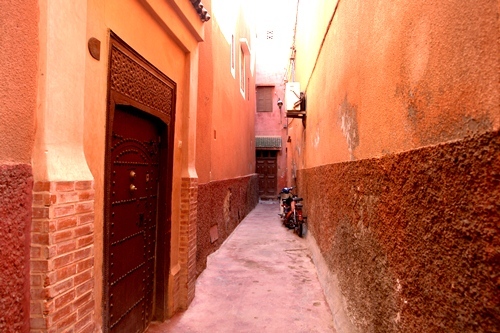 Carpets, scarves, pottery, leather, tables, door frames, candle-holders, all produced in backstreet workshops and sold on the main tourist routes. No money, no problem. A friend two shops down has a machine for AmEx, Visa or Mastercard. Elsewhere in the tangle of thoroughfares more existential produce is on offer. Fish and meat are hacked and sawed in tiny fishmongers and butchers that have never seen a refrigerator, bunches of mint piled high to add a sickly-smelling mask to the pungent smell of flesh. 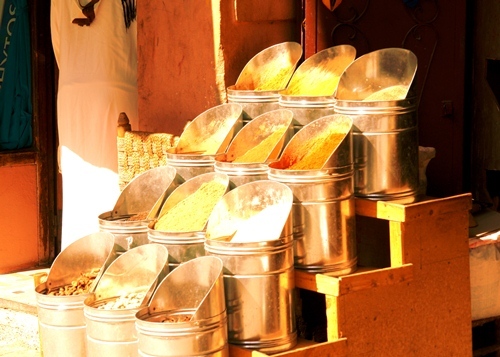 Dried fruit and nuts, buckets of spices, bottled water piled high, next to chicken who turn lonely circles in tiny cadges, waiting for a purchaser to summon the executioner. 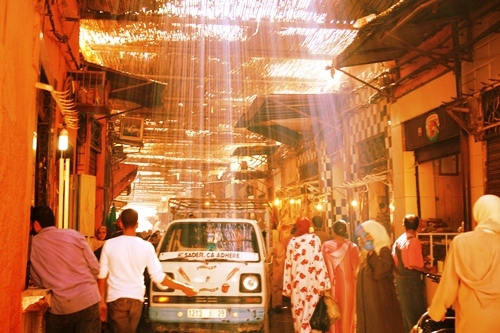 And alongside the hustle and bustle of the crowds, it is the smell of the Medina that lingers longest in the memory. Sweet oranges and pomegranates compete with the mint, spices, meat and exhaust fumes for your sensory attention, whilst in the corner of the Medina where the leather tanneries can be found, visitors eyes water at the impact of the ammonia from the pigeon-dung used to cure the skin, and the smell of dead animal itself. Once more the solution is mint, handed to the guest by a friendly guide in a fake-Nike shirt, offering temporary relief as you watch the men go about their difficult and health-damaging work. Fake labels are everywhere in the Medina as well, the junk amongst the craftsmanship – Gucci and Hilfiger are laid out on a blanket in the street by a man in flowing white robes and a dark bushy beard, the Muslim bogeyman of western nightmares selling the ultimate consumer symbols, Calvin Klein underwear the pride of his collection. At many point the Marrakech Medina feels too much, overwhelming the senses, and at times like these the luxury of the Riad courtyards is a wonderful sanctuary, but contrast of calm and wealth with the hustle of poverty outside the thick heavy doors a continued reminder of the disparity in this country between the haves, and the have-nots. This entry was posted in Places on September 28, 2012 by Paul Scraton. Great post, I’ve been there and know exactly what you mean.